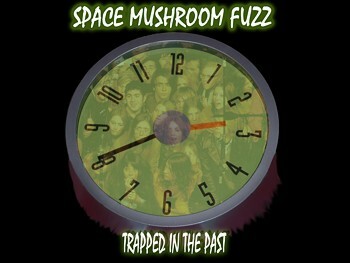 Recently, while browsing through bandcamp.com, I stumbled across Space Mushroom Fuzz. They are a new duo from Boston, Massachusetts, consisting of John Belcastro on drums and Adam Abrams on, well, everything else. Adam Abrams is also involved in progressive doom metal band Blue Aside and psychedelic stoner band Palace in Thunderland, but with Space Mushroom Fuzz he and Belcastro take off to the stars for some decidedly trippy spacerock. When Time Trippers Collide (released in June of 2012) is unabashed space rock, inspired by Hawkwind, but infused with its own sense of style and trippiness. The Palace Gates, the opening cut, is in fact practically a mission statement with its intense, pulsing guitar riffs, spaced out vocals and swirling, liquid effects. And with that Space Mushroom Fuzz are off the launch pad and soaring towards the stars. After an extended space intro, second track Watching the Watcher borrows a riff from Hawkwind’s Lord of Light, and just goes nuts with it, layering it with effects and way out there vocals (with Abrams singing completely different lyrics and melody to Lord of Light). It’s a blast of pure, adrenaline fueled spacerock, and perhaps the only direct nod to one of their influences. After that, the duo dives deep into experimental realms with Shine on You Crazy Train Part 1. Amusing title indeed, but it sounds nothing like Pink Floyd or Ozzy Osbourne, instead being a rambling, spaced out free jazz trip through the cosmos. For the first few listens, I found this part kind of slowed the album down a bit. At nearly 12-minutes, the track did seem to go on a bit too long. But the more I listened to it, the more I really got into its ‘birth of the cosmos’ kind of ambience. And when things pick up again with the mid-tempo mantric rocker Space Is Blue, full of freaky, shrieking riffs and apocalyptic lyrics, it all just seems to flow together perfectly. After a shorter return to ambient experimental liquid space territory with Shine on You Crazy Train Part 2, the band dives into the final track on the album, Wavestorm. It’s a real slow burner with hallucinatory, effects laden guitar work and mysterious, ghostly vocals. A deliriously freaked out way to end the album! Not content with just one album in 2012, a little later in the year Abrams and Belcastro put out their second album, Something Weird’s Going On (released in October of 2012). Opening cut, Sitting in Our Thrones, has an assault of frenzied guitar giving way to spaced out vocals singing about corrupted innocence and the nightmare of war. The song leads into a lengthy, mindblowing jam as Abrams and Belcastro totally cut loose, blazing a comet-like trail of heavy spacerock across the sky. Hawkwind influences return in the riff-heavy Living With the Curse of Shame. And then things mellow out for a bit with a trio of tripped out songs starting with Part 1 of the title track, a downtempo meditation on weirdness; the dark and acid drenched Scientist Sparks, with its thrumming acoustic guitars and bubbling, gurgling space ‘tronics; and part 2 of the title track, another moody excursion, this time in the vein of Pink Floyd. The final track on the album, Under Control, gives a nifty little surprise twist by taking the Hawkwind formula and amping it up bit with an early Rush vibe. Another solid album from Abrams and Belcastro. As if two albums in one year weren’t enough, squeaking in just before the end of December, Space Mushroom Fuzz released the two song EP Trapped in the Past. The title track takes SMF into new directions. With the substitution of Belcastro with Black Pyramid drummer Clay Neely, this release delves into a more proggier realm than previous releases. The title track still has some of that Hawkwind riffery going for it, but its acoustic intro and spacey outro and some cool tempo changes give it a more complex dimension. Second track, The Other Side of Life, gets even stranger, with jazzy chords and gentle acoustic guitars combined with oddball vocal melodies and sudden bursts of heavy psych freakouts. In the space of half a year, Space Mushroom Fuzz has already evolved, as their music expands outward, and I for one can’t wait to hear what they do next. Aural Innovations (AI): You’re a busy guy, involved in several other bands including playing bass and keyboards in Palace in Thunderland and leading Blue Aside. What prompted the Space Mushroom Fuzz project? Adam Abrams (AA): I wanted to do a lo-fi recording project to keep myself busy between working on the Blue Aside albums. Blue Aside records take a lot longer to finish because of the amount of overdubbing we do to get our sound. I needed a new musical outlet to keep myself occupied. Music is my favorite hobby so I figured I’d come up with a new project so I could spend my time doing something I love which is productive and will last forever rather than wasting my time watching TV. We are trying to do something different with Space Mushroom Fuzz. Like releasing more than one album a year. Having all the albums for free on Bandcamp and letting the people decide if and what they want to pay. These days every album can be traded digitally anyways so why not just make it available for free straight from the artist. The world is changing so we figured the structure of a band needs to change. Why press 1,000 CD’s and sit on 600 copies when you can press a very limited amount and sell them out. We are doing a cassette release too. But instead of getting them professionally manufactured, we are going to handmake and customize each copy. This includes special artwork from our favorite contemporary artist Ralph Walters (from Columbus), and an individualized hand-drawn picture by either me or John for each box set. This means not one will be the same, creating a unique numbering system. Plus, I always wanted to get John Belcastro on tape and collaborate with him musically. He was the original drummer in Palace in Thunderland until we first broke up in 2003. He is one of the greatest drummers I know. His style is perfect for the traditional Space Mushroom Fuzz sound yet he’s also versatile so he can accommodate the different genres we might explore. He’s a really good friend, and when you’re working with friends, you’re in a better creative environment. AI: There’s been a terrific burst of activity from all three of these projects over the past year, including new releases from all three of them (in the case of Palace in Thunderland, the first in 5 years. What happened in 2012 that made this all happen? AA: January 2012 Andy and Monte started jamming again, reformed Palace in Thunderland and quickly starting writing new songs. I wasn’t back in Massachusetts until April that year and they already had a few written! Netto (also the drummer for Blue Aside) rejoined in May. So by the fall, Palace was ready to record the ‘Stars, Dreams, Shores’ EP, which we finished in 4-5 sessions. Since then we’ve completed writing the full length and are going to start recording very soon. The new Blue Aside album, ‘The Moles of a Dying Race’ was tracked in 2011 and finished in 2012 but not released until September 2012. I started SMF in June of 2012 and kept busy through December, releasing the ‘Trapped in the Past’ single a couple days before the New Year. AI: The first Space Mushroom Fuzz track recorded was Shine on You Crazy Train Part 1. It was recorded in a, shall we say, interesting way. Can you tell us about that? AA: I was looking through my stuff at the studio and found some mushroom powder I had from a while back. It was a nice night, early June in Boston, so I decided to eat them! I took a walk to enjoy the scenery then thought it would be fun to try to record. I already setup the mics on the drums earlier that day to prepare for another band I was recording the next morning. So I established a groove in my head, pressed record and let out all the adrenaline from the mushrooms on the drum set. This was the foundation for Shine on You Crazy Train Part 1. I spent a couple more hours laying down the guitars and bass and pretty much finished tracking that song that night. AI: I noted in my review that Watching the Watcher seems to borrow a riff straight out of Hawkwind’s Lord of Light. Was this intentional? And does the title have any connection to Lemmy’s Hawkwind tune The Watcher? Yes, most of the first album was influenced by Hawkwind. Watching the Watcher was named after Lemmy’s The Watcher but Scientist Sparks (ed. From their second album) was inspired by the music. AI: Listening again to Scientist Sparks I really hear that now. I find it interesting that Space Mushroom Fuzz lyrics tend more towards psychological and apocalyptic themes rather than outer space and more obvious sci-fi tropes. What inspired these kinds of lyrics for this project? AA: Space Mushroom Fuzz lyrics are inspired by the thoughts that people have during psychedelic trips. The band was born during a mushroom trip so ideally the listener should be tripping to feel the full effect of the music both spiritually and sonically. AI: All tracks to date were recorded in Reverse Feed Studios, which if I understand it correctly, is your homemade studio. Can you tell us any more about this? AA: I got sick of paying money to go to studios and having to rush recordings so some time in 2009 I set one up at my practice space and been recording various projects since. All the tracking for the Blue Aside albums, aside from the drums was done at Reverse Feed. For the Palace in Thunderland, Stars, Dreams, Shores EP, the guitars were recorded at the Palace practice space (which is Monte’s basement) but the drums, bass and mixing was all done at Reverse Feed. Everything for the Space Mushroom Fuzz albums was done at Reverse Feed Studios aside from the drums on the Trapped in the Past single which was done at Clay’s studio – Black Coffee Sound. AI: I take it that with you playing mostly everything in Space Mushroom Fuzz save the drums, this is primarily a studio project. Any plans to pull a full band together and play the material live? AA: We played one live show this past August with Old Growth and BerT (both bands released something on Hydro-Phonic) at Radio, a venue in Somerville, MA. Blue Aside was supposed to be on the bill but had to cancel at the last minute. Joe from Blue Aside filled in on bass and we played a few tracks off When Time Trippers Collide with extended space jams in between. We found out that we were playing the show a couple hours before and had minimal time to prepare. We have our first real show March 21st at PA’s Lounge in Somerville opening for Hidden Towers on tour from Vancouver. Me and John have been jamming regularly trying to work out a 2-piece so we can tour. AI: The new single features Black Pyramid’s Clay Neely on drums instead of John Belcastro. Is this a permanent change or a temporary one? AA: This was just a one-time thing but it’s very possible for him to be on more SMF recordings in the future. I’m trying to do something different with SMF by not sticking to the traditional band member format and having guest musicians join us for an album here and there. In fact, I want one album to be only guest musicians. Meaning neither John nor I will play at all. Clay is a great drummer and has a studio in his backyard so it’s very easy for us to collaborate on projects. If not Space Mushroom Fuzz, I hope to record something with Clay very soon. AI: The new single seems to take a more progressive rock direction. Are you going to explore more of this newer sound? AA: We’ve already started recording the next album, Man in the Shadow, and it’s definitely not going in the prog direction. I’d say it’s more influenced by 70’s rock like Ted Nugent, Grand Funk Railroad and Judas Priest with hints of Hendrix, Skynryd and Deep Purple. 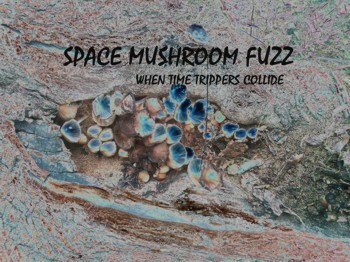 For Space Mushroom Fuzz, we are not sticking to any specific format, aside from incorporating a space rock vibe. Of course we will venture out again into prog territory but more in the vein of the end of Trapped in the Past rather than the jazzy chords used in The Other Side of Life. 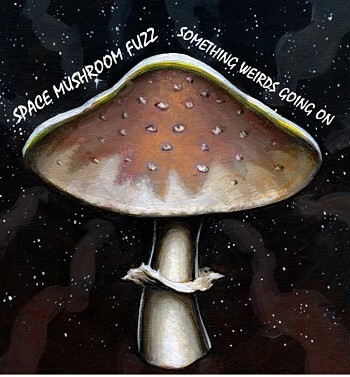 AI: We’re looking forward to what comes next for Space Mushroom Fuzz. Thanks for chatting with us Adam!